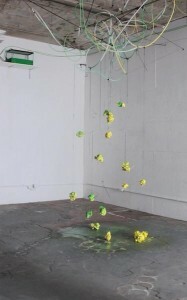 Nothing is lost (I), 2011. 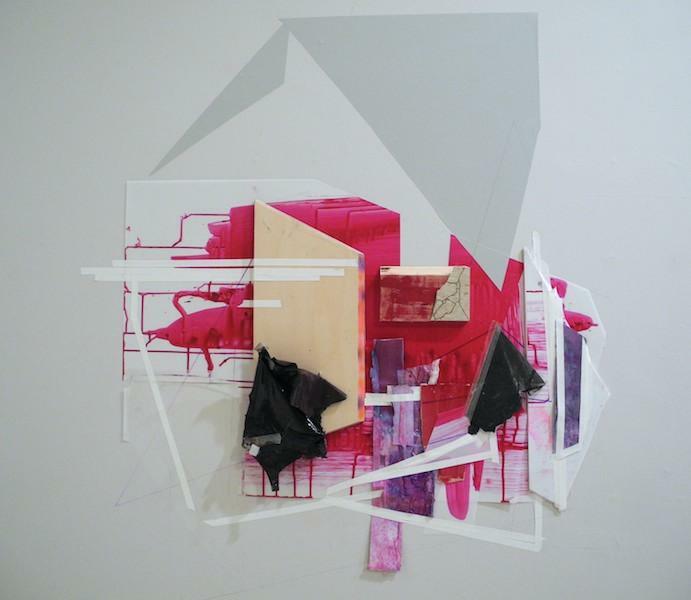 Wood, tile, tape, vinyl, pink residues, sharpie, everyday pen and acrylic on wall and paper. 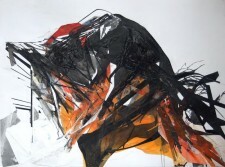 Nothing is lost (II), 2011. Wood, plexi, blue glue, blue residues, vinyl, photographs, sharpie, everyday pen and acrylic on wall. 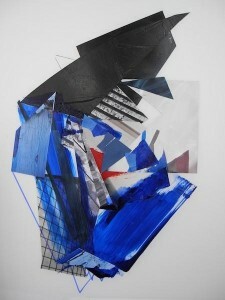 Nothing is lost (III), 2011. 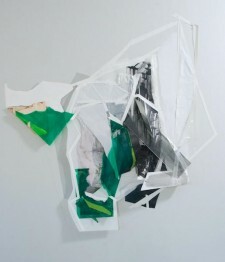 Wood, plexi, tape, vinyl, green residues, everyday plastic, everyday pen and acrylic on wall and paper. Untitled, 2011 Acrylic, photographs and pen on yupo. 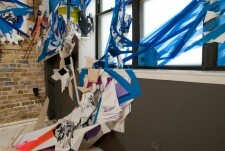 Blue Glue and Other Explorations, 2011. Unique Book Blue Painters Tape, Acrylic, Xerox, Studio Debris, Accordion Fold. 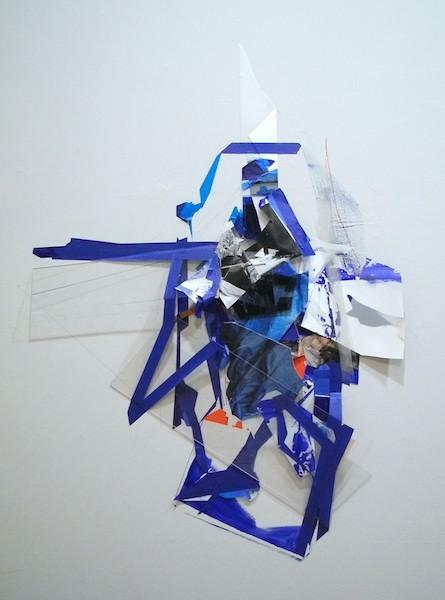 Folded 6" H x 11" W.
Detail, Blue Glue and Other Explorations, 2011. Ex(c)ercises in Erosion (#1) Salt Mountain, 2011 Unique Book Accordion Fold bound in Manilla File Folder Included Factors: Real and Manufactured Sodium Chloride,Tarping (Heavy Duty), Weight, Everyday Pen, Aprox. 3 years of Studio Detritus. Closed: 8 1/4" x 11 1/4". Open: 11 1/4" x 40". 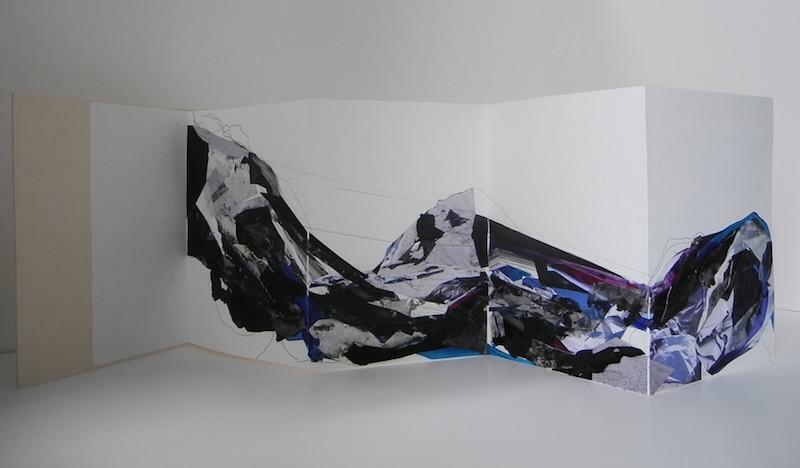 Detail, Ex(c)ercises in Erosion, 2011. All that is not very much, 2011 Blue painters tape and 6 years of studio residue. 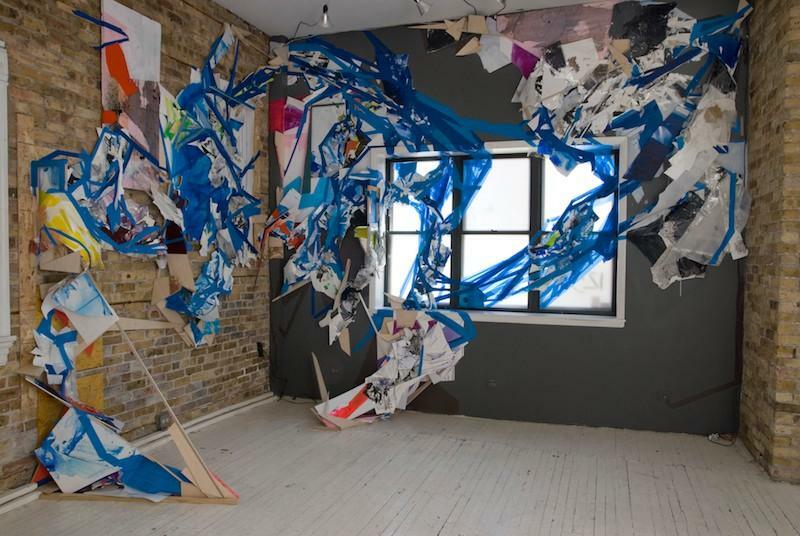 Installation at Happy Collaborationist's Exhibition Space, Chicago IL. 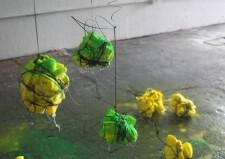 Detail, All that is not very much, 2011. Blue painters tape and 6 years of studio residue. 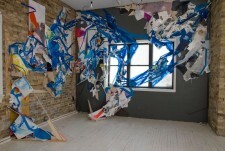 Installation at Happy Collaborationist's Exhibition Space, Chicago IL. 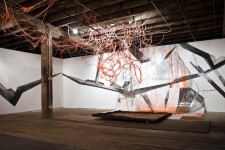 Internal Weather (construction cord orange), 2010. Found soap factory residues, plexiglass, construction cords, poly-tubing, straws, vinyl, acrylic, rust, charcoal, and graphite. Durational Installation at Soap Factory, Minneapolis MN. 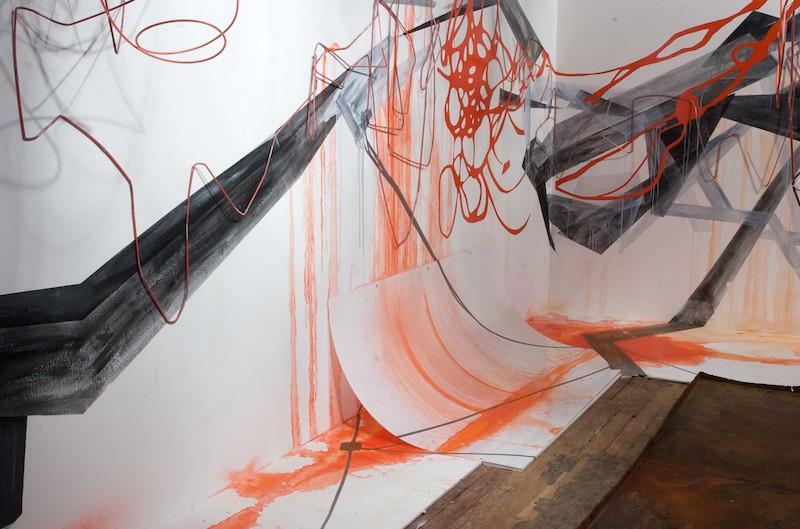 Detail, Internal Weather (construction cord orange), 2010. Even the Kitchen Sink, 2008. 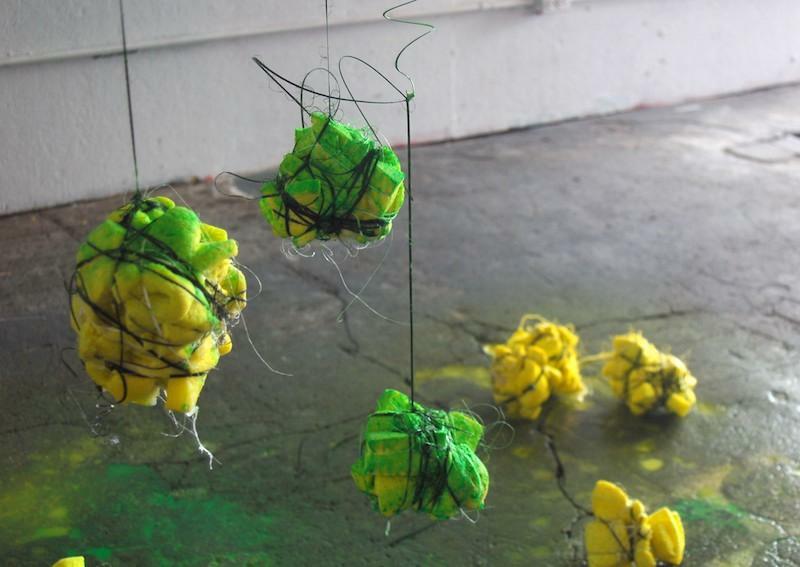 Multi-purpose sponges, found polytarping, grime, polytubing, joy dish detergent, acrylic and glycerin. 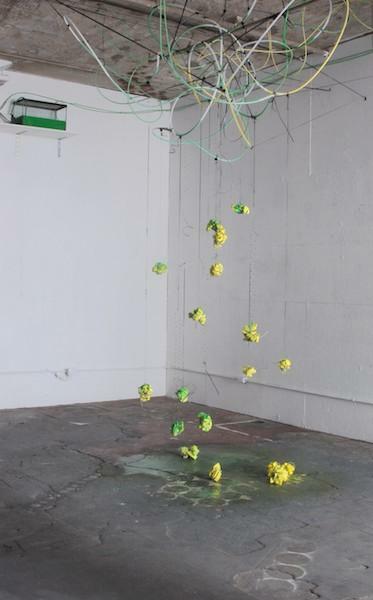 Durational Installation at Detroit Industrial Projects, Detroit MI. 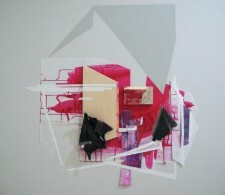 Detail, Even the Kitchen Sink, 2008.